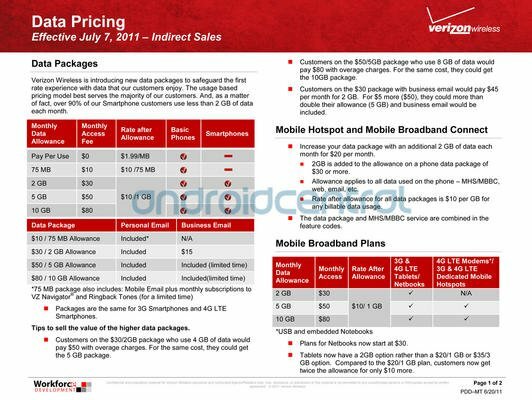 Having a hard time wrapping your head around the upcoming changes to Verizon's smartphone data plans? We just got all the dirty details dropped in our laps. Charts, e-mails, the whole kit and kaboodle, folks. Let's start with what you see above. That's the official chart from the official training document (which you can see in full after the break.) As previously rumored, smartphone plans will start at 2GB for $30 a month, with $10 per gigabyte if you go over. There also are 5GB/$50 and 10GB for $80 plans. Unlimited plans are dead. These rates apply to 3G smartphones and 4G LTE smartphones. Mobile hotspot access will cost $20 a month for 2GB of data. If you have Verizon's $29.99 unlimited data plan, you'll be able to keep it after July 7. If you add a line to an existing account, you'll not be able to chose the $29.99 unlimited data plan. If you're a new customer between now and July 7, you'll still be able to choose the $29.99 plan. So if you're in the market for a Verizon phone and want to get in on the current unlimited plans before the major changes take effect, you've got two weeks, folks. Now continue past the break to see the full documents and e-mail. As of this morning we have been given the green light to start training on the data changes Verizon Wireless is making effective 7/7/11. 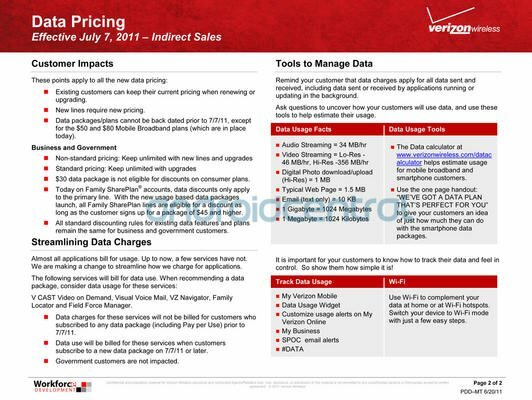 BUSINESS DISCOUNTS- After 7/7/2011 data discounts will only apply to the $50 and higher data packages on the primary line. So all changes effective July 7th, 2011. If an existing customer upgrades from a feature phone to a smart phone after 7/7/11, they will NOT be able to add on the unlimited data package. They must choose from the new data plans. Anyone who sets up new service with unlimited data, upgrades from a feature phone to a smart phone with unlimited data, or customer currently on the $29.99 before July, 7, 2011 will be grandfathered in. PLEASE, PLEASE make sure we take advantage of this heads up and get our heavy data users set up on these unlimited plans before they change. Please call, text or e-mail me any questions or concerns you might have.